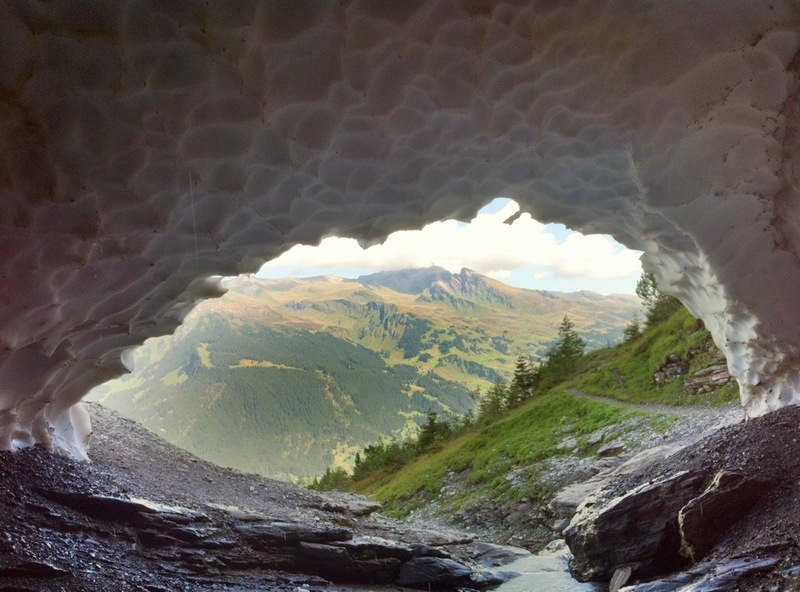 For rent: Private snow cave with Alpine views and running water. I spent much of yesterday traversing the slopes of the mighty Eiger, walking its length along the base of the famed North Face. It was one of my mountain-groupie moments, where I got to touch a true rock star. Even after a full summer, snow packs remained plastered against the Eiger’s cliffs, including this stunning bit of natural architecture. The snow had been eroded from within by the flow of a melt stream seeping down the walls of the North Face. Standing inside, the ‘window’ opened to a view across the Grindelwald valley to Schwarzhorn and Faulhorn. The traverse was something of a side journey I made on my final day of a hike between Engelberg and Lauterbrunnen. Over four days I’ve walked about 80 kilometres and, with my pathological need to take the highest route, climbed and descended more than 5000 metres. My knees suddenly creak like rusty hinges. The hike I’ve been doing is the self-guided Alpine Pass Route trip operated by UTracks (I get to walk alone, they get to cart my bag to the next hotel – win/win, as far as I’m concerned). It’s been a stunning walk in every regard – who couldn’t be happy with the Eiger, Wetterhorn and Jungfrau as hiking companions? Thoroughly recommend it. Back in my snow pack on the Eiger, the melt continued. The stream rolled on through the cave, and water dripped from its ceiling, soaking me in minutes – this private bit of snow real estate even came with its own shower. Those who’ve been following this blog until now will know the importance I place on introducing children to the outdoors, hopefully generating a love for the natural world and confidence in their own self-sufficiency. It seems suitable to wrap up the year with the final, and top, pick in my selection of the 10 finest mountain trails I’ve had the privilege to trek. My favourite trek over the many pairs of boots I’ve worn out is in Ethiopia, atop the mountain range known as the Roof of Africa. It’s a pretty short journey from No 3 in my list of mountain treks to No 2. From Torres del Paine National Park you need only skip across the border into Argentina to find yourself at the foot of Monte FitzRoy, less than 200km away. Perhaps the single-most impressive mountain I’ve had the pleasure to ogle, FitzRoy is an enormous bubble of rock – its summit escarpment is more than 1km in height – rising out of the fierce Patagonian Andes.